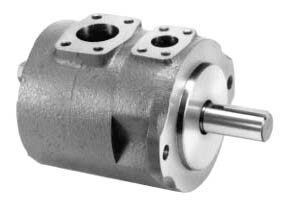 The new PH Series variable displacement piston pump provides major enhancements in sound reduction characteristics, higher pressures, and a wide range of control options. The Series offers 28MPa continuous pressure capability and a rigid pump design which lowers operational noise levels. The range of control options include constant horsepower control, electric direct control in addition to other controls such as load sensing and pressure compensator controls. A mainstay in industry, this low noise, high performance fixed vane pump series offers superior performance with high volumetric efficiency and very low noise characteristics. It is available in single, double, as well as triple pump configurations and in versions which operate on water glycol or phosphate ester fluids. 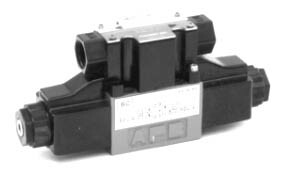 TOKYO KEIKI provides a full range of solenoid and solenoid pilot-operated directional valves from 20 liters to 800 liters. Our standard CETOP 3 and CETOP 5 solenoid valves feature high flow and high pressures, low head loss, with high allowable back pressures. 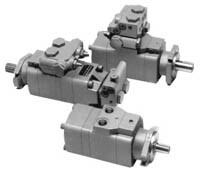 In addition, TOKYO KEIKI also offers unique valve configurations and models to fit specific customer requirements. Our fine current signal switching valves, DG4VC-3 Series, enable direct linkage to programmable controllers. Our DG4VS-3 shockless valve series allows the user to select the shockless function for the ON-OFF, ON only, or OFF only modes to match the application. We have developed the DG4SM-3 Series mini-watt valves which feature very low (5W) power consumption and direct programmable controller connection capability. Our Comnica line of valves offer shockless, proportional directional/flow control with the simplicity and ruggedness of solenoid valves. The COM Series’ onboard microprocessor enables easy parameter settings and adjustments with a digital readout to facilitate the task. Solenoid valve utility is preserved with features such as manual overrides and reduced wiring for operational convenience. 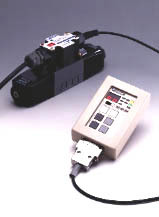 A handheld unit is available for remote setting and the valves may be connected to general purpose relays and sequencers. The CETOP 3 range has been recently augmented with the addition of the CETOP 5 through 8 sizes. Our EP Series of pressure, flow, and directional/flow proportional valves are available in a wide range of configurations to suit the application. 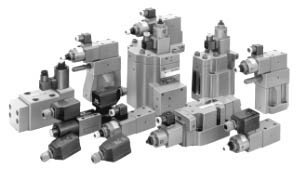 The Series offers integrated pressure/flow PQ models, directional/flow control valves with on-board controllers and precision fine flow control valves, as well as special low (back) pressure control valves for injection molding machine applications. TOKYO KEIKI’s ETP electronic pressure sensor and ESP Series electronic pressure switches boast superior accuracy, repeatability, and temperature drift characteristics. Integrated electronic circuitry provides voltage or current signal output. The ETP is equipped with a switch which makes sensor calibration easy. 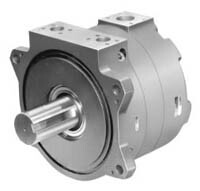 Our high torque low speed MHT Series vane motors are optimized for low noise and are aimed at industrial applications such as injection molding. The Series is available in single as well as multi-torque, multi-speed versions in displacements as large as 12,400 cm3/rev. Our CR, GR-M, and GRH Series of HTLS heavy duty gerotor motors are available in a broad range of displacements and mountings and are used extensively in mobile and industrial applications. They are offered in configurations which include integral brakes as well as two speed versions. TOKYO KEIKI’s TU-PAC and Q-PAC Series of standard power units are designed to meet the needs of users in the stationary market. The unique design of the TU-PAC Series maximizes heat transference and aeration in a low profile, space-saving package. A direct pump-mount manifold block option enables configuration of hydraulic circuits to meet specific customer requirements in a space-saving, piping-reduced design. The TU-PAC Series is offered in ten basic models with tank capacities of 10 to 60 liters. Our Q-PAC Series of power packages with direct-coupled piston pumps is offered in tank capacities up to 100 liters.